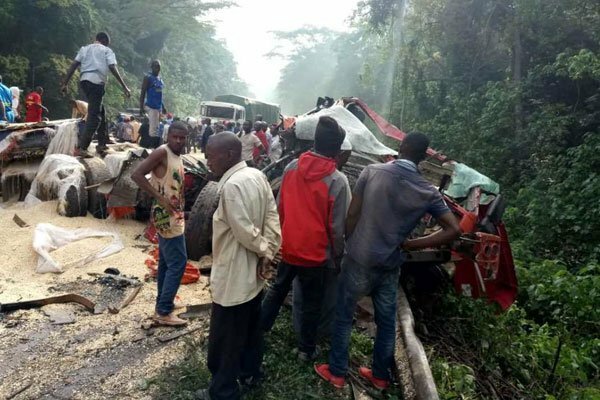 MABIRA – A fatal accident along the Jinja road highway close to Mabira forest has left four people dead including a police officer and 13 injured as the driver of a minibus tried to overtake in a corner, say the local Police. “A motor vehicle Costa Reg. No UBD 343P that was travelling from Kampala heading to Jinja tried to overtake in a corner at Sanga near the new picnic site and ended up colliding with a trailer Reg. No. T643DNU/T8441DND that was heading to Kampala from Jinja killing four people instantly” Said Butoto. Butoto has urged members of the public to always speak out when they realize indiscipline by any drivers or reach out to police on traffic checkpoints along the way.